This Sunday was a quiet one. Reading, preserving food, snuggling with kitties… just what I needed. 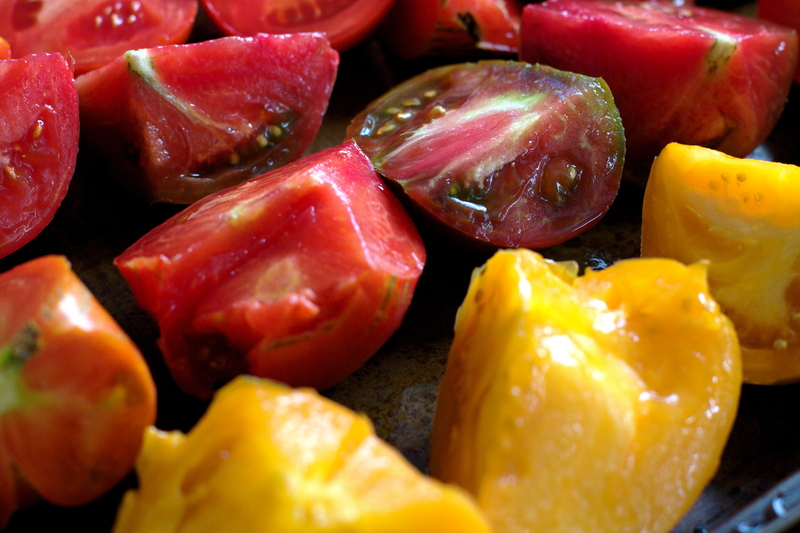 We had an abundance of heirloom tomatoes, so I chunked them up, drizzled them with olive oil, sprinkled with sea salt. Preheated the oven and following Orangette’s lead, roasted them for 7 hours at 200 degrees F. Popped them into the freezer, and know that my winter will be a little bit more delicious. Aren’t these colors just amazing? 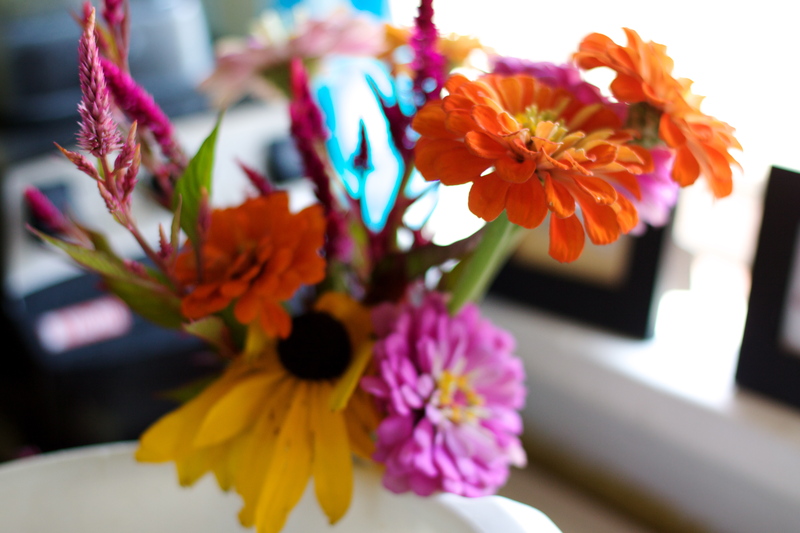 Flowers from April’s Garden, my wonderful CSA farm. 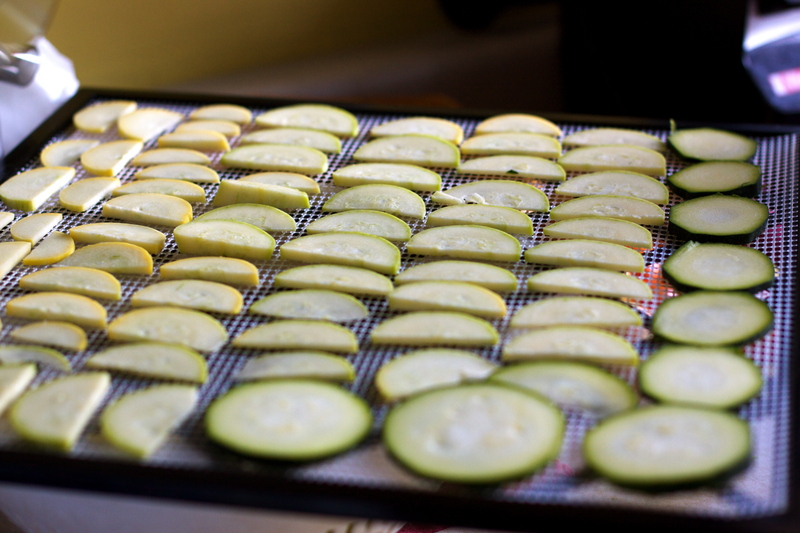 I wanted to try something different with the mountains of squash we have, so I decided to dehydrate them. The squash chips can be tossed into soups later in the winter, without taking up space in my freezer. 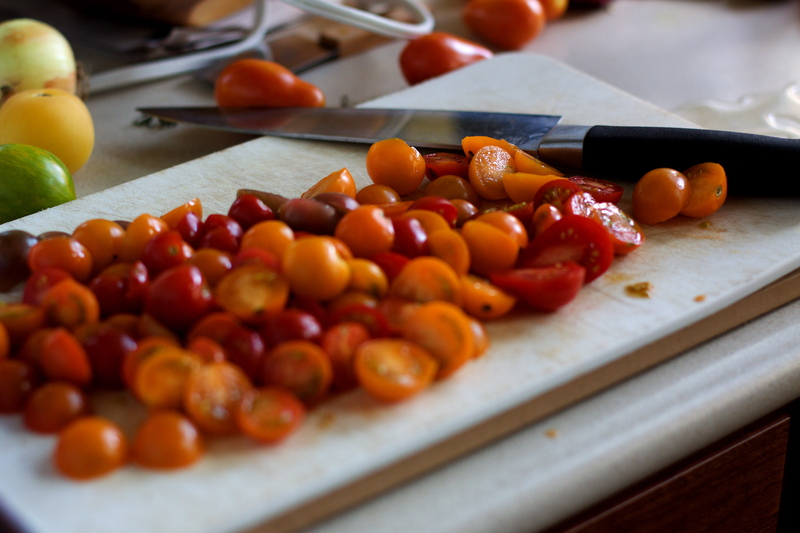 Halved up the incredibly sweet cherry tomatoes and sungolds. Dehydrated them for 18 hours into the sweetest, tiniest little “sundried” tomatoes I have ever tasted. Vinny and my current read. 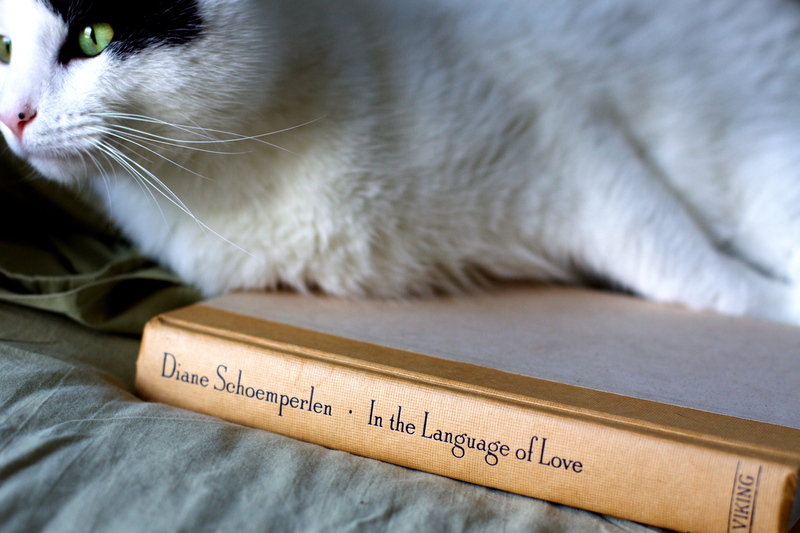 “In the Language of Love”, a novel in 100 chapters. Each chapter revolves around one of the 100 stimulus words from the Standard Word Association Test. I’m reading one chapter a day. It’s like doling out literary candy. What about you? How was your Saturday? ← Eat Local Challenge 2011 – Sign Up! i’m swimming in tomatoes! so far i’ve made ketchup, pasta sauce, and fried greens, but i’ve been looking for a quick(ish) and easy(ish) way to make “sun dried” tomatoes in the oven. i’ll have to try orangette’s method out! 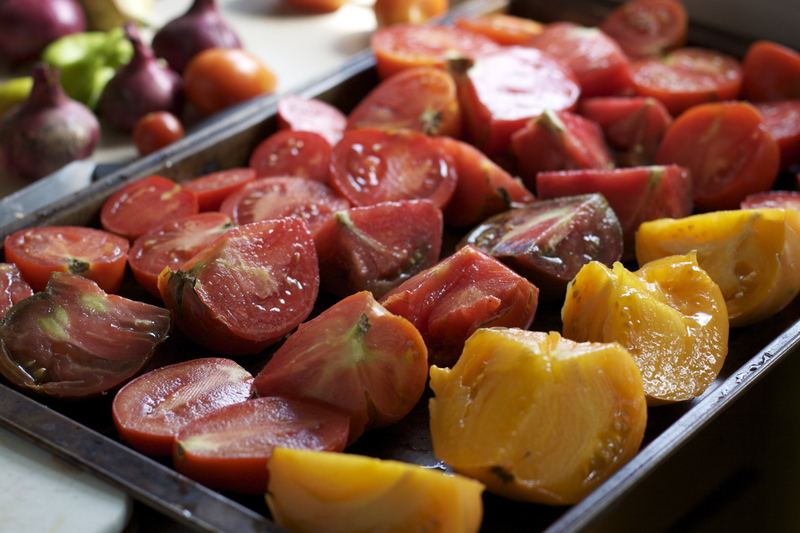 Those tiny tomatoes look scrumptious. And the dehydrated squash intrigues me…let me know they rehydrate! Dried sungolds are some of my favorite winter treats. I think I am going to give that squash idea a shot, I always forget about adding other dried items to soups in the winter besides mushrooms.